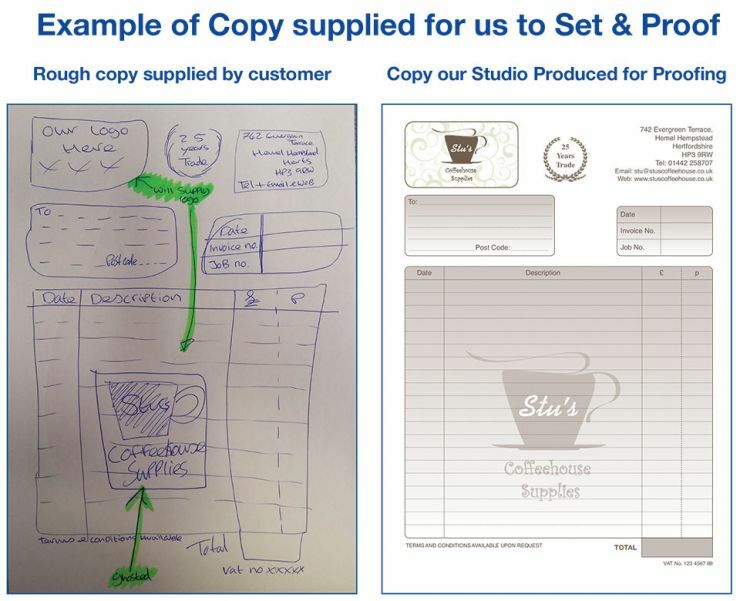 The Stock and Personalised products are there for those who want a simple and cost effective form. Nothing too elaborate. Just effective and well-priced. However, we would be delighted to produce a totally customised product for your business. Just give us a call on 01442 258707 and let us know what you would like. You are welcome to email (or post) a copy along with logos for us to set the artwork, or we can work off a rough layout you've designed. Our in-house studio team will then very quickly set and supply you with a proof - which is included in the existing charge - for your approval. In the above instance, the customer supplied a rough copy and emailed their logo for us to produce a professional looking copy for them to approve. The Size, Quantity and Parts etc. will all be discussed and finalised with our knowledgeable sales team. LOGOS: We are happy to assist with basic logo work but complex and detailed designs will need to be designed by a logo design company - of which there are many out there! If it's a single colour logo and you have a copy, we can scan it in. Please note, logos taken from the internet are normally VERY low quality and aren't normally good enough for printing purposes. If supplying a logo, then we require - 'SPOT COLOUR' EPS/PDF or single colour TIFF. If in doubt, give us a call and we can easily assist you.